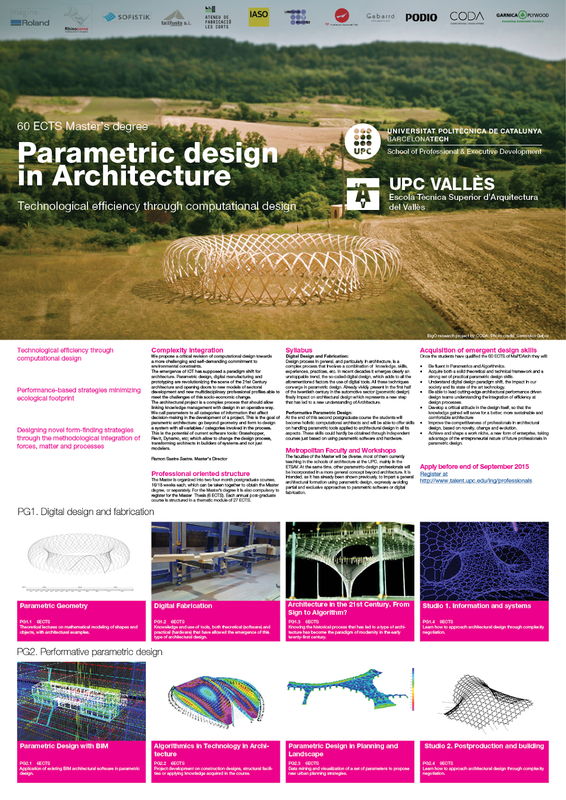 After four years of experimenting with contents and pedagogic formats at the successful Parametric Architecture intensive course held at ETSAV, Ramon Sastre, CODA, and The Metropolitan School of Architecture are stepping forward in the education of future professionals with the new master degree Parametric Design in Architecture. The Master Parametric Design in Architecture (by BarcelonaTech UPC School) is a unique opportunity to critically review computational design and move towards a more challenging and self-demanding commitment to environmental constraints. The architectural project is a complex process that should link knowledge management with design in an operative way. We call parameters to all categories of information that affect decision-making in the project development. This is the goal of parametric architecture: go beyond geometry and form to design a system with all the variables and categories involved in the process. This is the potential of current software tools: Rhino Grasshopper, Dynamo, and others. They allow change to the design process, transforming architects from builders of models to builders of systems. Our aim is to design and discover novel form-finding strategies through the methodological integration of forces, matter and processes. The Master degree, taught in the Metropolitan School of Architecture, provides a residence of international students as well as equipment and facilities of the latest technology necessary for this training. Its model workshop, digital laboratories and technology centre CRITT, and collaboration with the Barcelona Fab Ateneus Network, ​​allows students to explore all possibilities in parametric design techniques. Visit UPC School for enrollment info and further details.